Still need more help? Contact us! The development of a voice application ideally involves many testing steps. Unit, functional and integration tests give a developer a good degree of confidence about the application internals. But what about the platform as a whole? Telephony involves a larger number of moving parts compared to a web application, often requiring more server-side resources per user in addition to the usual persistence and logic layers. That complexity creates a series of unique scaling challenges. Some applications never see more than a dozen concurrent calls. But often we need to enable a single machine to serve a number of concurrent calls that is in the low hundreds. Since a telephony platform such as FreeSWITCH could be installed on any kind of machine from a single CPU virtual machine to a 32-core hardware monster, it is necessary for a voice application to generate concrete statistics about resource needs and usage. Goals for concurrent call numbers should be set from the start of development and acted upon according to quantitative analysis and results. You do not want to find out that your new business idea is so successful your platform melts under pressure, or that your profitability relies on pushing 100 concurrent calls in a single instance while your machine can only withstand 10! We will need to choose one or more tools to assist us in gathering the essential data we need. There is enough choice both in open source and commercial software to guarantee a brief analysis before we choose. SIPr or Sipper is an open source Ruby SIP stack that enables the creation, execution and verification of call flow scenario. Aside from being last updated in 2009, it is more suited to integration tests than load generation due to the relatively high complexity of a project. Empirix Hammer is a commercial testing suite available both as on-premises software and SaaS. It has many interesting features including comprehensive call analysis, statistics and enormous load generation capabilities, but is not free to use and the prices are not mentioned on its website. Enter SIPp, an open source command line utility that originated at HP and is freely available on a variety of operating systems. SIPp can be used not only for load testing, which will be our primary focus, but also to exercise a SIP implementation for compliance and compatibility purposes. Also available is Sippy Cup is a tool for generating SIPp scenario files and their associated PCAP audio. It makes working with SIPp much easier, especially when using it to drive an interactive call, like an IVR or other voice application. For the rest of this post, we will focus on using just SIPp alone. SIPp is a performance testing tool for the SIP protocol. It includes a few basic SipStone user agent scenarios (UAC and UAS) and establishes and releases multiple calls with the INVITE and BYE methods. It can also reads XML scenario files describing any performance testing configuration. It features the dynamic display of statistics about running tests (call rate, round trip delay, and message statistics), periodic CSV statistics dumps, TCP and UDP over multiple sockets or multiplexed with retransmission management, regular expressions and variables in scenario files, and dynamically adjustable call rates. SIPp can be used to test many real SIP equipements like SIP proxies, B2BUAs, SIP media servers, SIP/x gateways, SIP PBX, etc. It is also very useful to emulate thousands of user agents calling your SIP system. In short, SIPp can simulate one or more calls to your system in an automated fashion by directly leveraging the SIP and RTP protocols, testing the SIP dialogs and generating statistics. It can run a specified number of concurrent calls, ramping up numbers, up to a maximum number of calls, and many other uses. SIPp is not, however, suited for integration testing as the action set is quite limited compared to what could be achieved with something like ahn-loadbot, which can handle simple cases, or NuEcho NuBot, a dedicated IVR testing platform. SIPp comes with a few compile-time options to enable various functionalities. For our purposes, we will be compiling SIPp from the stable download, using a patch to enable dynamic PCAP play. The patch is necessary to allow us to play each PCAP audio capture file we have more than once in the same call, due to how the RTP protocol works. That reduces the need for having many different capture files recorded as they can be reused. The installation instructions are pretty straightforward. but we will be adding a patch originated on this mailing list post. Unfortunately the patch is no longer available but I have built a small repository for it here. On OSX there are no prerequisites other than the usual build chain. On Linux, you might want to refer to your distribution’s documentation, but libpcap and libncurses (and their development packages) will be needed. Note that there is no make install step,. Instead, you might want to copy or link the sipp executable to your preferred location. There are quite a few command line options available for SIPp. We will be explanining a sample command line to get acquainted with what SIPp can do for us. -i specifies the local IP to bind to in case you have more than one. Always specify the IP to avoid difficult to diagnose issues. -p is the binding port. -sf passes the scenario file to run. -l is the concurrent call limit, which means the calls that are running at the same time (Concurrent Calls – CC), and they will be added as the scenario progresses up to -m, which is the total number of calls that will be run, at a rate per second of -r calls (Calls Per Second – CPS). -s is the service part of the target SIP uri, such as 123 in 123@host.com. The host part is simply the main argument for the command. A scenario is an XML file containing the steps for the call to be run. Steps mainly consist of <send>ing SIP packets, setting a <recv> expectation on the counterpart sending a specified SIP command, plus some other tags that can be used to execute actions and to pause the scenario. The scenario will then be run sequentially, and SIPp will display the various steps, number of successful completions and failures for each, plus some other information. It is important to note that SIPp will consider anything that is not exactly happening as specified as an error. SIPp comes with a number of built-in scenarios, but you will probably want to build your own. A good way to get started is to use the -sd option to dump one of the built-in scenarios, either to console or to a file. For example sipp -sd uac_pcap >> integrated_uac_pcap_scenario.xml will write out the client scenario with PCAP, which is the common starting point for most usage we will be exploring in this post. The result for that command can be seen here. The scenario starts with an INVITE expecting an optional 100 TRYING and/or 180 RINGING, followed by a mandatory 200 OK. After ACKing the response, the scenario plays some PCAP file, then pauses for the duration of the recording. This is necessary because playback is a sort of an “async” action here, and execution would continue before the RTP replay is done. We then see the scenario send a DTMF digit, some more pausing, and a BYE signaling the end of the call. A final 200 OK is expected in response to the BYE. As you can see, this scenario could easily be used to test an IVR. I have copied the relevant PCAP files to the blog post repository. You might be asking yourself now, what is a PCAP file? Why cannot you just use your own .wav files? SIPp does not understand audio in the way some other more high-level software does. It only speaks two protocols: SIP and RTP. The only way to have SIPp send audio is thus to replay a recorded packet capture of an RTP stream. That entails a series of difficulties, both at the capture and at the playback stage. The recommended tool for network traffic capture and analysis is Wireshark. It is a invaluable application to use for any and all SIP and telephony diagnosis situations, so a good degree of familiarity with it is essential. To obtain a RTP PCAP, run a Wireshark capture during a SIP call, generating the needed audio on one of the call legs, usually the source side. Then, using ip.src == SRC_IP_ADDRESS and ip.dst == DST_IP_ADDRESS and rtp, isolate the packets you want to save. Using File/Save and the Displayed filter, you can then create your .pcap file. Playback of PCAP files has to adhere to the RTP protocol rules. Since your packets have a Sequence and a Timestamp, they will only be accepted the first time they are played in a scenario, then silently discarded. The patch mentioned above in the installation steps gets around this by rewriting the Sequence number and updating the Timestamp for packets before they are sent. wav2rtp is a tool that can generate PCAP files from some audio formats (currently G.711u, GSM 06.10 FR and Speex) with the ability to emulate network delay and losses. It is distributed in source form and can easily be compiled on the major platforms. SIPp bundles a variety of PCAP files in the pcap/ directory in the source, some of which I have put in the repository scenarios/pcap folder. To explain things further, I will be building a sample Adhearsion application I will then be load testing using SIPp. You can find the app in the ahn_appfolder in the repository. It is a very simple app that plays a sample Asterisk file, then asks for input and logs the result. The corresponding scenario file is very similar to the one we generated earlier. I only removed the first PCAP play and shortened the initial pause. To run a scenario against Asterisk without using authentication, which is not at all easy to do with SIPp and not in scope for this post, you will want your sip.conf to contain allowguest=yes, using this only for testing as it allows your Asterisk server to accept calls from non-authenticated parties, and allow=alaw to allow the codec we are using in the scenario. You will also need your default context sending calls to Adhearsion in extensions.conf. After setting up and running the Adhearsion application cd scenarios then sudo sipp -i 192.168.10.1 -p 8832 -sf ahn_app_scenario.xml -l 1 -m 1 -r 1 -s 111 192.168.10.11. If everything works. you can then start raising limits and seeing how high you can go before your box starts having issues, such as call durations that are below or above the expected time. SIPp is a very strict testing tool, and as such it only accepts call flows that are exactly as specified. For example, if you have a pause in your scenario, SIPp interprets that as “no SIP interaction should happen during this time at all” and will report a failed call if any SIP packet is received during the pause. The same principle goes for any SIP packet or interaction. SIPp is not a “call simulator” like a developer would think at a glance, and a scenario is not the same thing as simply picking up a softphone and dialing an extension, pressing DTMF as you go. Every single SIP dialogue will have to be accounted for, RTP set up has to happen in your scenario packets, and in general the SIP call flow must strictly adhere to the scenario. Your first step in developing your own scenario is thus testing it over and over to make sure you do not have any fake failures. That said, if your only goal is load testing and you have access to the server side, you can some times just run the load tests anyway and spot issues from the logs. That is not, however, a recommended approach as your statistics will report many failed calls that are not “real” failures and thus lose some of their usefulness. If you try running the above scenario with sudo sipp -i 192.168.10.1 -p 8832 -sf ahn_app_scenario.xml -l 5 -m 50 -r 2 -s 111 192.168.10.11 -trace_stat -fd 2 you will notice a new .csv file appears in the working directory. That file contains the statistics collected during the test, with the -trace_stat option enabling them and -fd setting an interval in seconds between writes. I have left a sample run in the repository for your convenience. SIPp collects a large number of statistics that are dumped to the file. Columns marked with (P) represent the instantaneous reading at t for that metric, while those marked with (C) represent a cumulative or average reading and are usually more representative of results. The main metrics you want to turn your attention to are call duration, response times and of course failed calls, if you tuned your SIPp scenario to avoid false failures. Call duration should be consistent with what you are expecting from the scenario and application. If calls are too brief or too long your application is probably failing silently while honoring the SIP dialogue specified by SIPp. Response times, defined as the time the application takes to “pick up the phone”, are a good indicator of a telephony system’s level of load, as most application exhibit a linear correlation between Call Per Second (CPS), concurrent calls and increased reaction times. 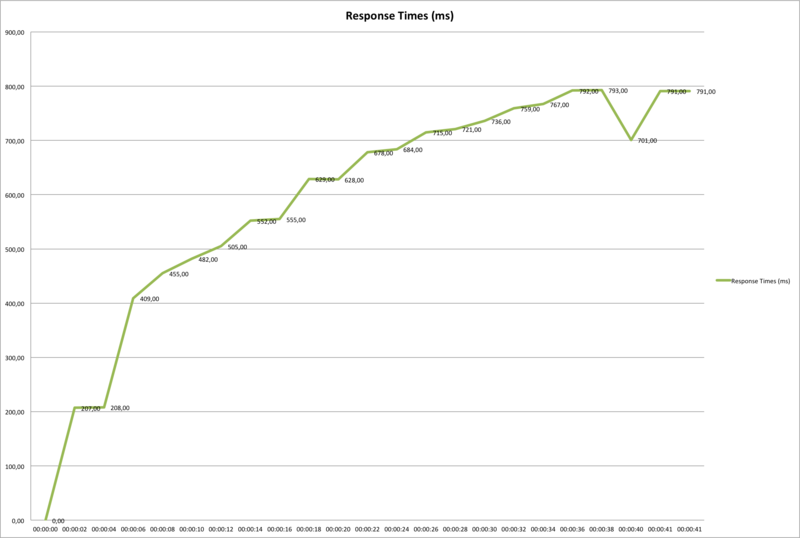 Aside from the tail of the graph being skewed by calls not being started any more, you can notice a consistent trend in raising response times. When the same scenario is run with a larger maximum number of calls, the response times reach a very slow increasing trend which almost looks like a plateau. That, in this case, indicates we are close to the potential maximum load for the machine. The above metrics are very important in gauging your application’s reaction to load, but must be complemented by thorough analysis of the server logs to spot anomalies and odd events. CPU and memory usage as reported by the server can be matched to the SIPp statistics to gauge general load and per-call resource needs. Your application should if possible be instrumented to provide performance reports at the testing stage, and the general application logs will show exceptions and correct call flow completion during the load test. It is also recommended to do some recorded test runs to make sure the application and scenario are operating correctly, especially regarding media. A recording can reveal QoS issues introduced by call volume and make sure that the call flow is being followed correctly. SIPp has a few recommendations for tuning your load generating system, which should always be separate from the tested application to avoid mistaking bad performance on the machine running SIPp for legitimate issues with your server. Every telephony platform has a set of standard recommendations for performance you might want to get familiar with. Platform themselves usually have very good throughput out of the box if given enough resources, so the first tuning step usually lies in the application layer, whether Adhearsion or anything else. Aside from SIPp and Wireshark, I have found a variety of other tools helpful in designing and running load tests. Callflow is a graphical SIP call flow generation tool. It allows you to visualize the SIP dialogue happening during the call in SVG format, by feeding it a tcpdump/Wireshark capture. It can be very helpful in diagnosing SIPp failed calls. PJSUA is a command-line, scriptable SIP client. Aside from being a full featured CLI softphone, it can be used in automated fashion to answer calls and play audio, thus providing a counterpart in case your load testing scenario involves dialing out to peers. ahn-loadbot is an Adhearsion 1 application that drives an Asterisk instance to execute test scenarios, and can be an useful alternative to SIPp for integration testing. The higher complexity ahn-loadbot presents make it less well suited for load testing unless it is run on a very powerful machine. SIPp does not look very user friendly at first glance, and in fact it is not. But in the hands of a skilled person, it becomes an invaluable tool for testing a variety of situations, and especially load testing in a controlled and meaningful way. It is thus an irreplaceable tool in the arsenal of a VoIP developer or sysadmin, and together with Wireshark/tcpdump can often be the only way to diagnose difficult issues. All code for the post can be found here for your reference. Mojo Lingo provides consulting services for load testing telephony applications. Let our experts help you design and run your next load test. Contact us today to learn more about how we can help. This entry was posted in Technical HowTo and tagged ahn-loadbot, Callflow, Empirix Hammer, FreeSWITCH, IVR testing, Load Testing, NuEcho NuBot, open source, opensource, PJSUA, Ruby, SIPp, Sipper, Sippy Cup, SIPr, telephony, Treadmill, voice applications, voice apps. Bookmark the permalink. I run SIPp as ./sipp -sn ‘uac_pcap’ 192.168.234.30 -m 1 but I get a 603 Decline in response to the INVITE in the scenario. It sounds like your SIP server does not allow calls from whatever host you are sending. The easy way around this is to whitelist the IP address. The more involved way would be to set up SIPp to actually do SIP authentication, but this is somewhat tricky. How to actually go about doing this will depend on what system you are trying to test. For example, on Asterisk, the easy way to enable this is to set “allowguest=yes” in the [general] section of sip.conf, but DO NOT DO THIS IN PRODUCTION, as you may open yourself to toll fraud! If you need more help try asking on the SIPp mailing list. Also, Mojo Lingo is available for professional engagements if you are interested in that option as well. Very nice write up. Thanks for take the time putting this together. is there a way to make the test by using g729 codec? Can I use it for testing presence scenarios. Just Publish-Subscribe-Notify? I know I can test presence scenarios using SIPp. I meant to ask can I test presence scenarios using sippy_cup or sip treadmill? I wan’t to test my kamailio server for UAC And UAS Scenario with register. My UAC and UAS registers well but UAS is unable to receive the invite sent by UAC. can anyone share their suggestions ?? ?